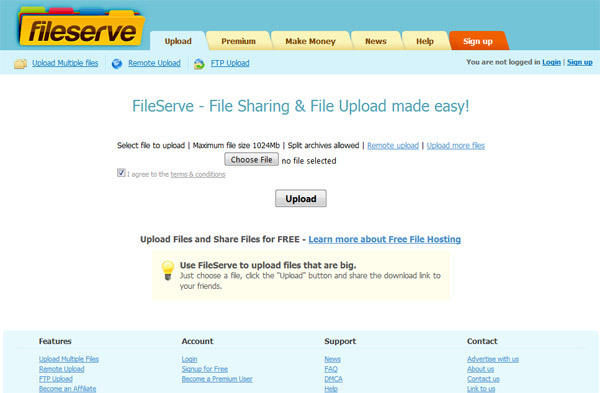 FileServe allows you to upload files with maximum file size of 1024MB and share them with the world, but the best thing is that you can earn money while uploading and sharing the files you’ve uploaded with friends, family and even strangers! The amount you get paid depends on the file size of your files and where from (the country) the person downloading it is with the maximum payout of up tot US$25 per 1000 downloads. The greatest thing is that you get money from downloads no matter which country in the world the user is from, but of course for some countries you get more and for some less. 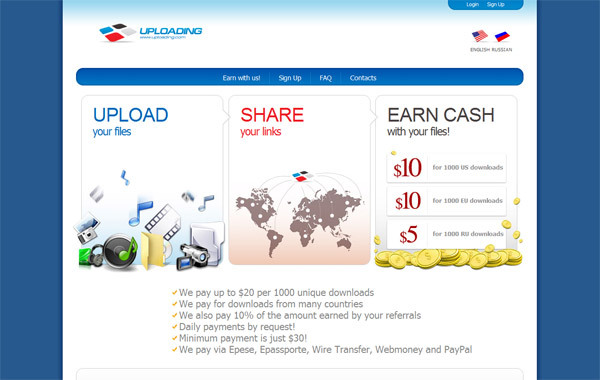 If the user downloading the file is from United States, United Kingdom or Canada you can get between $3 and $25 USD for 1000 downloads, depending on the files size. If the person downloading is from France, Germany, Spain, Portugal, Italy, Denmark, Sweden, Switzerland, Netherlands, Norway, Ireland, Finland, Australia or New Zealand you’ll be earning between $2 and $22 USD per 1000 downloads. If the person downloading is from Russia, Austria, Poland, Romania, Hungary, Czech Republic, Belgium, Latvia, Estonia, Lithuania, Luxembourg, Slovenia, Slovakia, Cyprus, Sierra Leone, Liechtenstein, Bulgaria, Greece, Turkey, Iran, Japan, Singapore, Malaysia, South Africa, Qatar, Bahrain, Kuwait, Saudi Arabia, United Arab Emirates, Brazil, Oman, Malta or Gibraltar the payment for 1000 downloads is between $1 and $17 USD. And for the rest of the world you’ll be earning between $0.50 and $5 USD for 1000 downloads also depending on the file size. Payments are being made every monday via PayPal, Epassporte or Payoneer (you choose what type of payment) with a minimum payout amount of $20. FileFactory gives you the opportunity to upload and share files for free up to a size of 400MB and share them with everyone, while at the same time earning money when they are downloaded. The amount you get paid depends on the file size of your files and where from (the country) the person downloading it is with the maximum payout of up tot US$15 per 1000 downloads. fortunately FileFactory does pay for downloads fro users from quite a lot of countries all over the world, so here is the list of all these: American Samoa, Andorra, Anguilla, Antarctica, Antigua & Barbuda, Aruba, Australia, Austria, Bahamas, Barbados, Bahrain, Belgium, Bermuda, Brazil, Bulgaria, Canada, Cayman Islands, Christmas Island, Cocos (Keeling) Islands, Comoros, Cook Islands, Costa Rica, Cyprus, Czech Republic, Denmark, Dominica, Estonia, Falkland Islands, Faroe Islands, Fiji, Finland, France, French Polynesia, French Southern Territories, Germany, Gibraltar, Greece, Greenland, Guam, Hong Kong, Hungary, Iceland, India, Ireland, Israel, Italy, Jamaica, Japan, Kirbati, Kuwait, Latvia, Liechtenstein, Lithuania, Luxembourg, Macau, Malta, Mauritius, Mexico, Monaco, Netherlands, Netherlands Antilles, New Zealand, Norway, Palau, Panama, Pitcairn, Poland, Portugal, Qatar, Reunion, Romania, Russia, Saint Kitts and Nevis, Saint Lucia, San Marino, Saudi Arabia, Seychelles, Singapore, Slovakia, Slovenia, South Africa, Spain, St Pierre and Miquelon, Sweden, Switzerland, Thailand, Tonga, Turkey, Tuvalu, United Arab Emirates, United Kingdom, United States, US Minor Outlying Islands, Vanuatu, Vatican, Virgin Islands (British), Virgin Islands (US). You can choose what you do with your earnings. Withdraw money by PayPal or Moneybookers, or request an Amazon gift voucher. Simply specify your choice in your account and if your earnings for the previous month exceed $20 you’ll get payed automatically on the fifteenth day of the month! There is an easy way to monetize the traffic of your blog or website if it is related to new products and technologies, gadgets, tech news, entertainment, gaming, photo or video and so on with the help of WidgetBucks. In order to get a good revenue from the visitors you have on your site you don’t have to rely only on the traditional ways of internet advertisements and WidgetBucks offers one great alternative to all the boring banners you see everywhere. WidgetBucks uses the so called shopping ad widgets that display products based on the buying trends of 100 million online shoppers and these are spanning hundreds of categories and millions of products. Along with that WidgetBucks’ CPC-based shopping ad widgets give your site visitors an eye-catching designs to attract their attention and clicks. Each WidgetBucks ad is fortified with YieldSense – a smart, proprietary advertising technology that automatically analyzes, displays and rotates the highest-yielding content into a publisher’s site to pay the highest possible eCPM and maximize publisher earnings. Now you’re probably wondering how much can you make with WidgetBucks. How much you earn for CPC (Cost-Per-Click) and CPM ads depends largely on your site’s traffic and content. For international CPM ads, the CPM rate varies by region from around the world. Have in mind that if your site traffic comes from a country not on either the CPC or CPM Country list, it does not earn revenue. Here are the countries that will generate revenue upon viewing and clicking on the ads: USA, Canada, United Kingdom, Germany, France, Italy, Netherlands, Denmark, Sweden, Norway, Belgium, Spain, Australia, Austria, India, New Zealand, Portugal, Puerto Rico, Singapore, South Africa, Switzerland, United Arab Emirates and Ireland. WidgetBucks makes payments 45 days after the end of each month, if the account has a balance of at least $50. The two supported methods for getting payed available to choose from are: PayPal and Bank checks.